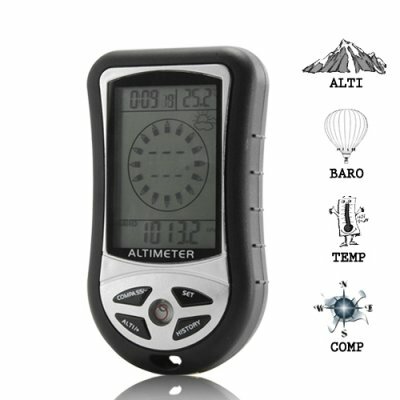 Successfully Added K3 - Wristop Digital Compass, Altimeter, Barometer, Thermometer to your Shopping Cart. The K3, a full-featured wristop computer! This quality device from Chinavasion is a digital compass, altimeter, barometer and temperature gauge in one. It sports an improved 2.1 inch rectangular readout display screen, and costs a fraction of what similar products sell for on the market today. Don't believe us? Search Google using the term "wristop" and see how expensive other wrist-top outdoor sports watches go for. Companies like Suunto, Casio, and Timex make similar products but they sell for 10-20 times more than the price of The K3 from Chinavasion. If you're a reseller, this is what you've been waiting for. You know what we're talking about - one of those guaranteed sellers that comes along every couple of months and makes you a ton of money in just a few days. We saw it happen with our Japanese-inspired LED watches and it's going to happen with the K3 as well. They're guaranteed to sell out quickly especially at this great price! The K3 - Wristop Digital Compass, Altimeter, Barometer, Thermometer is perfect for: mountaineers, climbers, hikers, trackers, rangers, law enforcement officials, military professionals or anyone else that needs exacting environmental data! Digital Compass: You have to see it to believe it! The K3's four bearing mode allows you to see compass directions and bearing, digitally in real time. Move the unit, LCD numbers immediately adjust to reflect new coordinates. The circuitry of this device also allows for external magnetic field calibration and declination settings! Digital Barometer: Atmospheric pressure on your wrist! It may seem like science fiction, but it's true and it's available on the CVPA-OG04. The K3 - Wristop Digital Compass, Altimeter, Barometer, Thermometer is your outdoor bestfriend. It has a super bright 5 second LED backlight and oh yeah, it also predicts the weather based on temperature and atmospheric pressure readings. Did we mention it tells the time too?! Pick up your digital wristop computer for the Great Outdoors today before we're out of stock tomorrow. Brought to you by the online leader of wholesale direct from China electronics and dropshipping - Chinavasion. Note: This great new product is available without MOQ (minimum order quantity) for a limited 60-day run. After that it, it will only be available for bulk orders with a MOQ of 2. Hurry, get your sample orders in now to experience this great product for yourself! . Works with two AAA batteries. Why is The K3 so inexpensive?